All HISD campuses serving pre-kindergarten students are participating in a common registration window during the week of April 29 through May 3 for families to register children for pre-K classes for the 2019-2020 school year. Offering a common week for registration allows the district and campuses to communicate and advertise to all school communities. However, parents do not have to wait for this window as schools are ready to register students right now. HISD provides full-day pre-K programs focused on the development of literacy, math, and social skills that serve as the foundation for children’s success in their educational careers. This entry was posted in Early Education, Elementary Schools, News, Preschool on April 4, 2019 by HISD Communications. The Houston Independent School District’s C. Martinez Elementary School is starting a weekly Facebook livestream event to focus on literacy. Every Tuesday evening, students can login to Facebook (CMES Readers Den) for “A Night in the Wolves Den” and listen to a special guest read a bedtime story. The intent is to help build literacy at home by engaging with CMES teachers and staff in a way that is current and fun. To join in, add CMES Readers Den as a friend on Facebook and turn in on Tuesdays at 7:30 p.m. to hear a bedtime story read by a teacher. This entry was posted in Early Education, Elementary Schools, Literacy, News on March 21, 2019 by HISD Communications. Nestled in the heart of Montrose, the Wilson Montessori campus was filled with excitement on Monday as students entered the doors of the newly renovated building for the first day of school. Final construction work wrapped on the project this summer, with Monday marking Monday the first time that both the new wing and existing classroom renovations were complete and open to students. This entry was posted in 2012 bond, 21st century schools, Business Operations, District VII - Anne Sung, Early Education, First Day Openings and tagged 2012 bond, 2012bond, bond 2012, Build HISD, BuildHISD, Wilson K-8, wilson montessori on August 30, 2018 by HISD Communications. HISD has launched another series of billboards across the city to continue raising awareness on the district’s educational initiatives and services that support the whole child. In February, HISD revealed a new logo and tagline in a series of billboards and movie theaters around the city. The second series of billboards to recently launch highlights prekindergarten and career and technical education programs. The billboards will run until Aug. 15. For more information about HISD’s latest education initiatives, visit www.houstonisd.org/enroll. This entry was posted in Career/technical education (CTE), Early Education, HISD: Our Story, News, Preschool on July 26, 2018 by HISD Communications. Give your child a head start by enrolling them in prekindergarten now. Pre-K is just as necessary for academic success as kindergarten or first grade, research shows. Not only will your child be more successful in school, but they will be more likely to graduate high school, attend college, and earn higher wages as an adult. While all children benefit from pre-K, disadvantaged and low-income students often make the most gains. Children who are dual-language learners develop English-language proficiency and other valuable skills. Research shows that children who have enrolled in pre-K gain an advantage over their peers in the classroom. 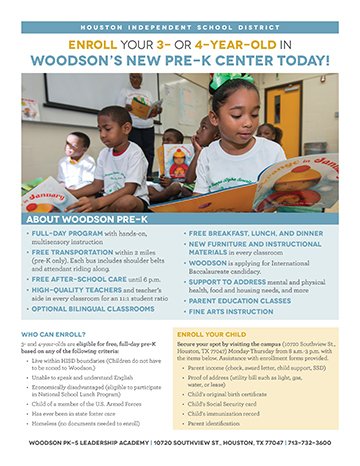 HISD offers both free and tuition-based pre-K at many schools, as well as early childhood centers. All pre-K students in the district receive breakfast and lunch during a full day of instruction from certified teachers. This entry was posted in Early Education, News, Parents, Preschool and tagged pre-kindergarten on June 12, 2018 by HISD Communications. HISD is expanding its full-day pre-kindergarten program at Woodson PK-5 Leadership Academy to provide more 3- and 4-year-old students in the Sunnyside community with the opportunity to attend a high-quality program that will build a strong foundation of learning and will support the transportation, after-school care, and health needs of the families it serves. The school will be hosting three upcoming events to encourage parents to enroll, including a pre-K roundup day, neighborhood block walk, and a registration carnival with school supply giveaways for 3- and 4-year-olds, immunizations, and a food bank. This entry was posted in Early Education, HISD: Our Story, News, Preschool and tagged Woodson PK-5 on June 5, 2018 by HISD Communications. The Houston Independent School District is encouraging parents to register early for pre-K for the 2018-2019 school year during the Week of the Young Child, which is April 16 through 20. Pre-registration will still be available before and after this week, but schools are celebrating the Week of the Young Child as a formal window for pre-K roundup and to showcase HISD programs and celebrate the district’s young learners. The Week of the Young Child is an annual celebration sponsored by the National Association for the Education of Young Children (NAEYC). This entry was posted in Early Education, Elementary Schools, HISD: Our Story, News, Parents, Preschool and tagged pre-kindergarten, Week of the Young Child on April 5, 2018 by HISD Communications. Roaring applause and cheers of joy echoed throughout the Parker Elementary School cafeteria on Monday as Principal Lori Frodine welcomed students to the first day of school in their new building. To mark the first day, students gathered by grade level for assemblies in the cafeteria, where Frodine excitedly introduced the students to the new facility and its features and answered their questions. “You guys have the coolest music rooms ever,” Frodine said to the eager students seated before her. This entry was posted in 2012 bond, 21st century schools, District IX - Wanda Adams, Early Education, Elementary Schools, HISD: Our Story, Magnet/School Choice, New schools, News and tagged 2012 bond, 2012bond, bond 2012, Build HISD, BuildHISD, fine arts, Magnet Program, Magnet programs, magnet school, magnet schools, new school, new schools, parker elementary, Parker Elementary School, Parker ES, Wanda Adams on March 19, 2018 by HISD Communications.